What a great weekend I had. Thank you for the sweet birthday wishes to Chris. He said Thank You to you all. I got to bond with this little one (Jonah, my newborn nephew, 3 days old). His face has a lot of expressions and he has a strong grip too. I let him hold my finger and I couldn’t believe how strong he was already for only being a few days old. A few days ago, I made muffins for my sister so she can enjoy them after they come home from the hospital after she gave birth. 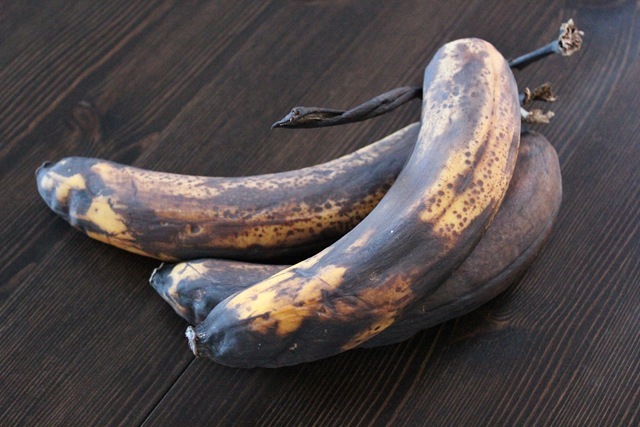 These bananas were one day away from fruit flies. I think they are definitely past their prime and I thought the best way to use them was to bake with them. I used this recipe at Eat Better America website and adapted it. 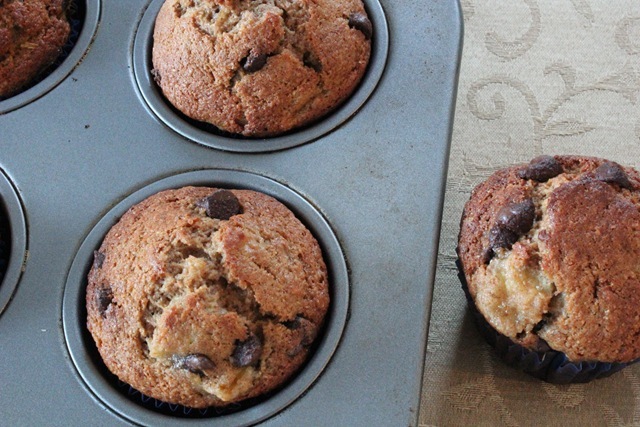 The very ripe bananas above were perfect for baking. It’s a natural sweetener, and allowed me to use less sugar in the recipe without sacrificing the sweetness. 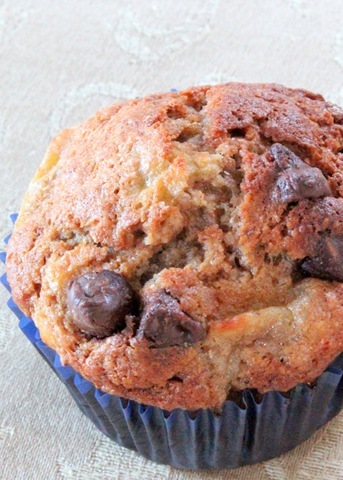 I think the key to these muffins tasting great is using bananas that are really ripe and never been frozen. The muffins came out moist. Make sure not to over-bake them. Store them in air tight container after it cools. 1. Heat oven to 375°F. 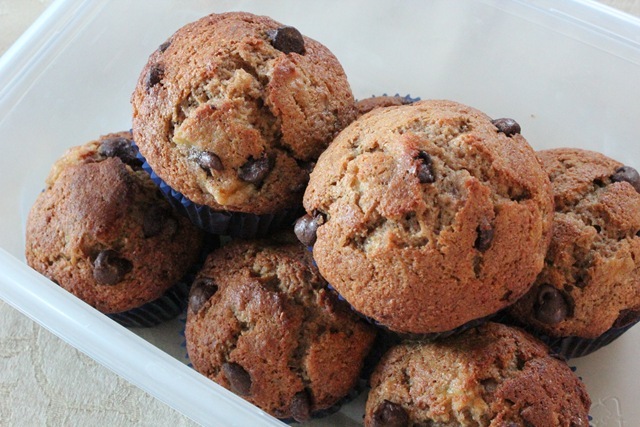 Spray bottoms only of 12 regular-size muffin cups with cooking spray, or line with paper baking cups. 2. In large bowl, mix flour, 2/3 cup sugar, baking powder, baking soda, 1/2 teaspoon cinnamon and salt. 3. In medium bowl, beat bananas, eggs, oil, milk and vanilla with fork until smooth. Stir into flour mixture just until flour is moistened. Gently stir in chocolate chips. Divide batter evenly among muffin cups. 4. Bake 20 to 24 minutes or until light golden brown and toothpick inserted in center comes out clean. Immediately remove muffins from pan to cooling rack. I love biting into the banana chunks in the mix. How was your weekend? Did you do anything fun or relaxing? P.S. I have all our pictures from our engagement shoot. I will be posting my favorites this week. naners and chocolate are the best. as for how my weekend’s been, i’m in austin now for sxsw and having a blast! Your nephew is the cutest! I want to be an auntie too :). Jonah is so adorable!! 🙂 Those muffins look so good!!! I can’t wait to see your engagement photos!! 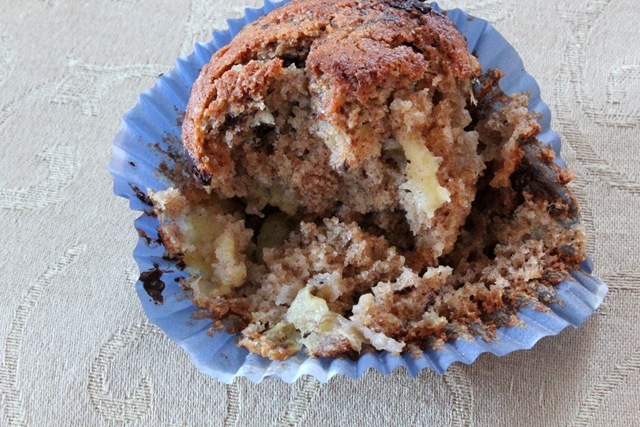 My mom used to make muffins like those when I was younger and they are soooo good! 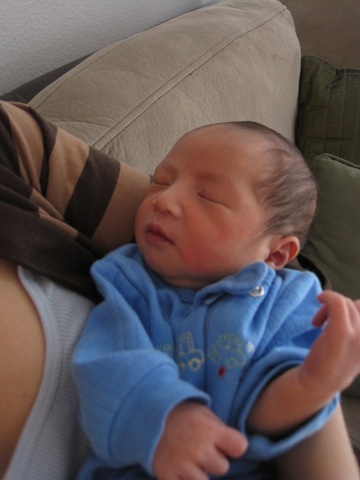 Awww your nephew is adorable look that skin so beautiful! You’re such a sweet and giving person your family is best to have you and we to as friends here! Didn’t know where else to post it but did you here that Disneyland replaced Mc Donalds for BabyCakes. aww what a sweet baby! and “I really enjoy baking for others. I love testing out recipes and finding ways to make them healthier. I like knowing my family and friends are able to eat better and healthier treats, even if it is one muffin at a time” –you took the words right out of my mouth!